Instructions: Chop onion and jalapenos. In a bowl, combine sausage, hamburger, 1/2 of onion, 1 egg, tomatoes, and bread crumbs. Mix thoroughly with hands. Pack meat mixture into bottom of dutch oven. Cover with lid and Bake at 350 degrees for about 30 minutes. 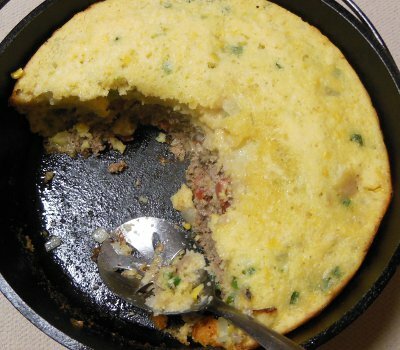 While cooking meatloaf, combine muffin mix, milk, and 1 egg in bowl. Stir in jalapenos, creamed corn, and remaining onion. Pour muffin mix over cooked meatloaf. The meatloaf will have shrunk while cooking, so some mix will fill in sides of dutch oven. Bake for another 20 minutes, until muffin mix is cooked through.